For those of you living at Avimor, you may have noticed today huge numbers of small birds flitting about in the brush along the hillside and flying from tree to tree very quickly. I too have been amazed at the incredible quantity...they are just everywhere today. Those are Yellow-rumped Warblers. They vary in plumage quite a bit, but most of ours today look like the picture below, but usually with a yellow throat. I went to check on the feeders at the Big Sit! 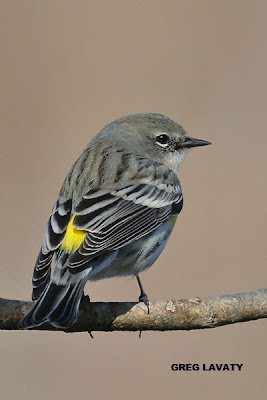 area this afternoon and I watched for just a quick few minutes as all the Yellow-rumped Warblers moved through the trees. I was extremely delighted to see three separate Townsend's Warblers moving along with them. That is another official record Avimor first! 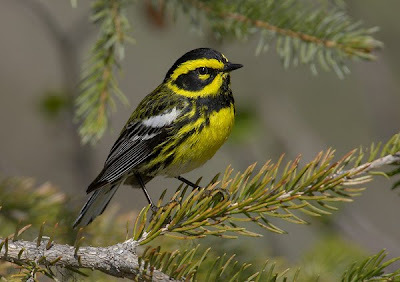 I think these are one of the most beautiful warblers of all of them. The numbers of White-crowned Sparrows and Dark-eyed Juncos have skyrocketed as well. I have heard that the tail-end of a cold front will often bring lots of migrating birds. That was pretty apparent this afternoon.